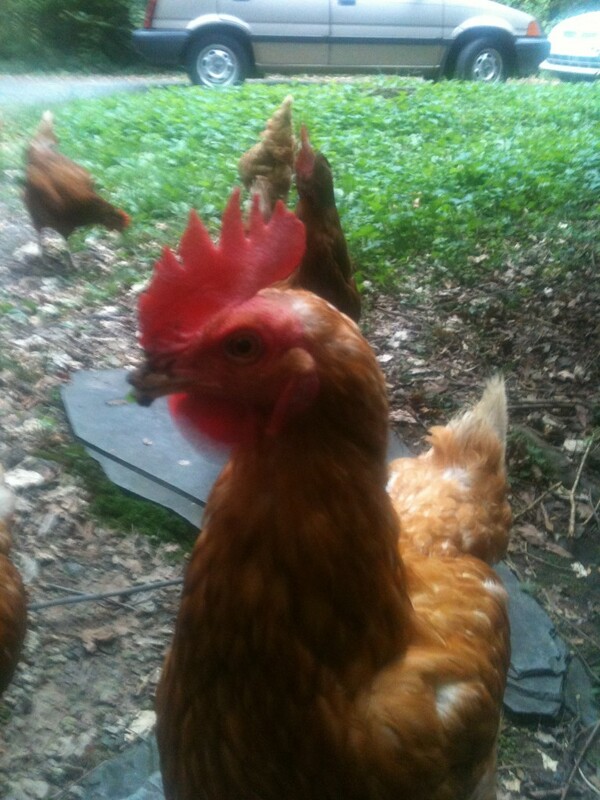 Each afternoon, we give our chickens a chance to free range. They get about 90 minutes of freedom, before dark. That’s enough time for them to eat a few bugs and enjoy themselves, but not so much that they become a nuisance to the neighbors or become a target for hawks or big, loose dogs. First, they run for the hydrangea bush beside our back door. We throw vegetable scraps into the bush and, when they get loose, they race to see what treast await them. After about five minutes there, they suddenly — all at once — get the idea to run and fly across the yard and into my neighbor’s yard. He sometimes leaves them a treat. It’s hilarious — and what makes it funny is the way they take off, so fast and in a pack, running to get to where they want to go. Once there, they either get the treat or hunt and peck for bugs. Today, they somehow had a sense that my neighbor was out of town. Instead they raced around to the front yard and spent time there. This video shows first twenty seconds of their freedom, just after I open the door of the henhouse. 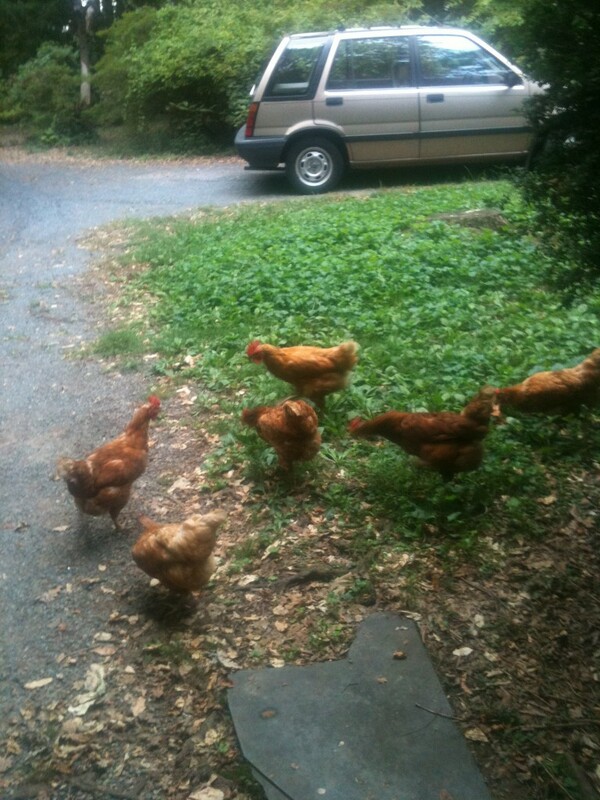 Yesterday, I’m stepping out of my office, which is a converted garage attached to my house, and I notice that all six of our chickens are gathered in a pack in the front yard. So I lower myself to take a picture and they come running — either gathering for the picture or trying to peck my phone. Is she going to peck my camera? We’ve had these chickens a few months. It all started a couple of years ago. Randy Solt, owner of Consign 120, used to advertise with our business, Coffee News. Randy has chickens, and he brings eggs to his store and sells them for $2 a dozen. And I got hooked on the eggs. Fresh eggs taste better. 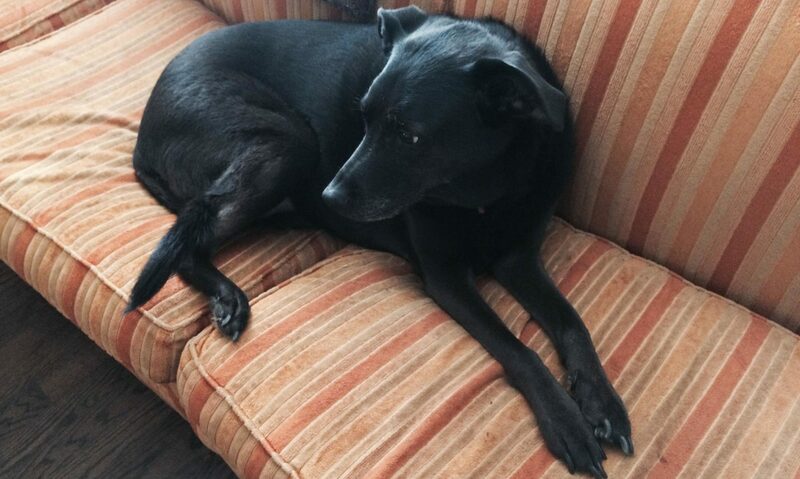 Randy knew I was hooked — so much so that, when the girls were busy and laying a lot and he had a lot on hand, he would call me up and I’d drive to Concord. For eggs. Then, one day, I get a call from another Randy, Randy Klocke, owner of Rooster Hill Farms. Randy Klocke buys an ad in Coffee News for the henpens he sells, and we work out a deal. The deal includes an ad for Randy and a fully functional henpen for the Post family. We pick our color — green — and it’s there in a few days, complete with six golden comet chickens and everything required to take care of chickens — including Randy’s thorough, well-written, and entertaining user’s manual. And every day since, we’re enjoying fresh eggs, every morning, and feeding and watering and talking to the chickens in our yard. We do not live on a farm. We live in the city, a couple of blocks from Catawba College and only three blocks (easy walking distance) from all kinds of shopping (Food Lion, Walgreens, convenience stores, coffee shops, restaurants). Our yard is normal size. Neighbors are close. It’s not Manhattan, but you’d have to say it’s an urban area. And I love these chickens. We don’t have a fence, yet. So we only let them free range for a couple of ours each day, in the late afternoons, for about two hours. We open the henpen door about six o’clock. When darkness descends, they return to their pen and we shut the door. In the morning, we gather the eggs. And then it’s decision time. Omelette? Fried? Scrambled? Or, when I’m in the mood for something really tasty, my favorite: the Hole-in-One. Yesterday, I dropped by Consign 120, a store in Concord, and bought four dozen eggs. Randy, the owner, also has a farm, and he brings in fresh eggs each day. I often stop and get a dozen, or two, or three. The reason I got four dozen is because I promised to bring 30 hard boiled eggs to the family Passover Seder on Friday night. I got extra because these eggs are small. Fresh eggs are harder to shell when hard boiled that the ones in the store that could be several weeks old. But they taste a lot better — so I’ll work it out (rolling the eggs first and shelling while hot; a little salt in the water, mutilating a few…). A few months ago, Randy didn’t have many eggs. He had a fire in the barn and the chickens were traumatized. They weren’t laying. Now, in mid-April, the girls are happy. He has dozens of eggs on hand. An egg, on Passover, has many symbolic meanings. In our family, we most often refer to it as a sign of life. It’s also the only food that gets harder as it cooks longer — and that has some meaning (can’t remember what). For Easter, the egg symbolizes the seed of life and resurrection of Jesus Christ. 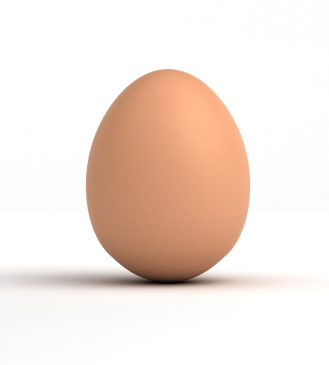 And for both religions, of course, the egg is a symbol of spring and new birth. But I have a different theory. I think both holidays (and religions) started using eggs because it’s peak laying time for chickens and there were so many of them. Tapi, who was an exchange student at our house when I was in high school, a roommate in college, and still a dear friend, grew up in Finland. I remember him telling me that his mother gave him hard boiled eggs in the morning, in winter. He put them in his pocket and used them to keep his hands warm on his way to school. Then he ate them for lunch. When I was in college, I had the opportunity to spend a semester in Italy, in Venice. Venice is close to the Dolomites – very good skiing – and I took advantage of that several times. I remember a meal from that time (1976). I was in the mountains and went to a small restaurant for dinner. I ordered the cheapest thing on the menu. My Italian was weak and, in those days, not many Italians spoke English. I had no idea what I had ordered. The waiter brought me a bowl of broth and an egg. He cracked the raw egg and dropped it into the soup. Growing up, breakfast before school was a little different than it is these days. My mother took orders, each morning. She had five children, a husband, and a busy, full-time job. Yet, each morning, she asked us how we wanted our eggs. Fried? Scrambled? Omlet? Sometimes I placed my order while I was still in bed, or getting ready for school. Sometimes I was already at the table. Either way, my mom took special orders from everybody, every morning. How things have changed. My kids never had eggs for breakfast. There wasn’t time. These days, I do get eggs many mornings – and my wife fixes them (or me). But it’s a matter of how many, not how I want them cooked. Her dishes are always fantastic, but if I don’t want them the way she’s cooking them, then I can cook them myself. Come to think of it, I haven’t had breakfast yet. Something was different. They looked like eggs. They tasted like eggs. The bowl of grits looked like an ordinary bowl of grits. The toast was plain toast like many other pieces of plain toast. And yet, after the fork touched the food, before reaching the mouth, the color of breakfast shifted, like the shadow from a cloud passing over the eggs. A pasty hue. A ropey taste that wafted and then concentrated toward the glands. An anxiety. Nerves in the upper chest, rising into the neck. It was the calmity of death. Sitting, heavy, on the fork. One egg was enough. No grits. Only half a piece of toast. Here are the ingredients. 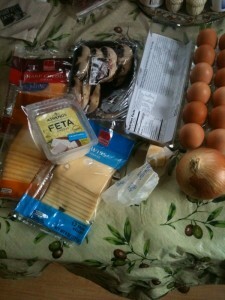 Eggs, four kinds of cheese, mushrooms, onions, and garlic. Did not take a picture of the omelette. It tasted great, but looked a little deformed. It broke apart when I removed it from the pan. I’m guessing 2011 will be much the same. It will break apart. But I’ll still share it. And eat it. And it will taste great.